Col's Creating Memories: Whiff of Joy - April blog Hop! Welcome to the April Whiff of Joy Blog Hop! If you didn’t come here from KARINA'S blog, then head on over to the start of the hop at Whiff of Joy Blog. I don’t want you to miss a single stop on this hop! This month we have a huge release! Adorable rubber stamp images, gorgeous die-lights, sweet backgrounds and amazing mixed media sets! All with a whimsical Spring theme! We love the versatility of mixing and matching our stamps and die-lights to create unique and personal projects and we know you will too! This month, we will be giving away 1 rubber stamp and one die from this release to one very lucky winner. The winner will be drawn from those who have left a comment on each of our DT blogs and the Whiff of Joy blog. At the end of the hop, go to the Whiff of Joy Blog, let us know that you have left a comment at each stop of the hop by using the inlinkz tool and you will be entered for a chance to win! A complete list of the hop is also at this blog, just in case you get lost along the way! The hop will remain open until midnight Tuesday April 22nd CEST. Winners will be announced on the Whiff of Joy Blog. This beautiful image is 'Spring Bees'. With this sweet image I decided to alter a notebook. I layered and stitched some patterned papers, added a doily and some lace for a delicate touch and some stickles to the bee's wings and edges of the image to add a bit of sparkle. To my flower cluster I added a WOJ charm and WOJ's Vintage Button Twine to finish it off. Thank you for joining us, I hope you are enjoying the blog hop and gorgeous release this month and a happy Easter to you! So pretty, I think this is my fav for the new releas stams, <3. Your colouring is beautiful. That cute book, I liked the stamps of the bees!!! So fresh! So lovely! Thank for inspiration! Supersweet Colleen, like the image and your coloring is great. Wonderful Embellis and Colors. It's a sooooo beautiful pimped block ... like it very much! Your altered notebook is adorable! I love all your flowers and details! Your colouring is beautiful! Love the added sparkle! Ich like the way you made the new look on the notebook. Sweet card! Beautiful layers and textures! 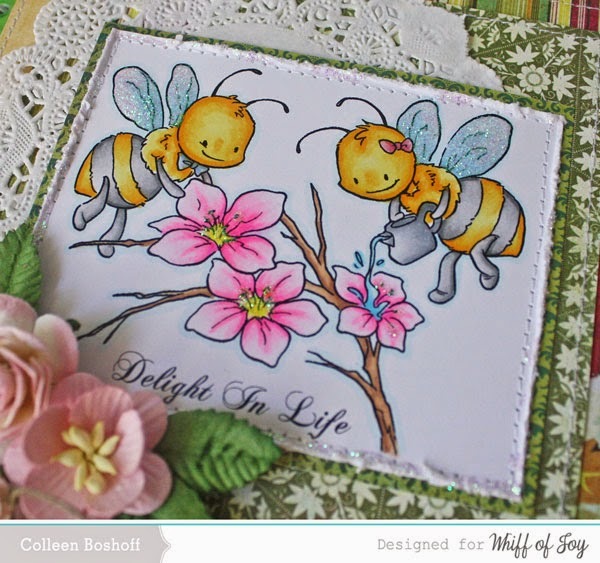 Love the sweet Spring Bees image and your gorgeous coloring! And the sparkle on the bee's wings looks fabulous! What a cute notebook. You did a great job on this. 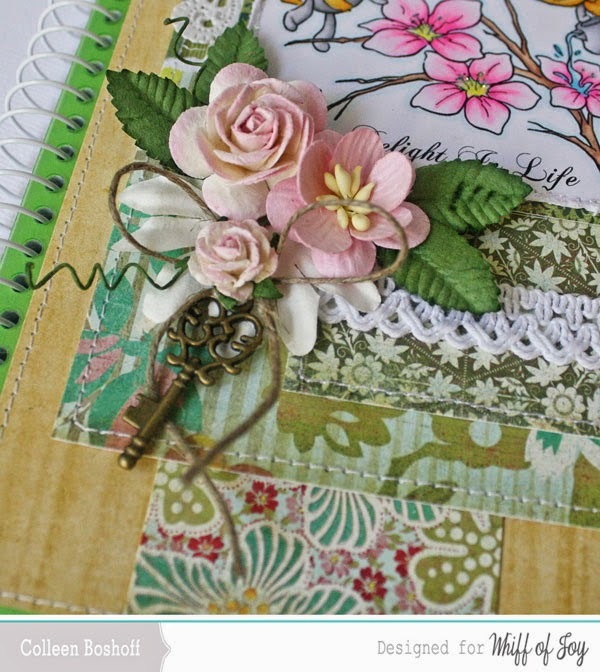 Your paper choice, embellishments and stamping and coloring look terrific. Wow such a beautiful book! And I love how you colored the image!! 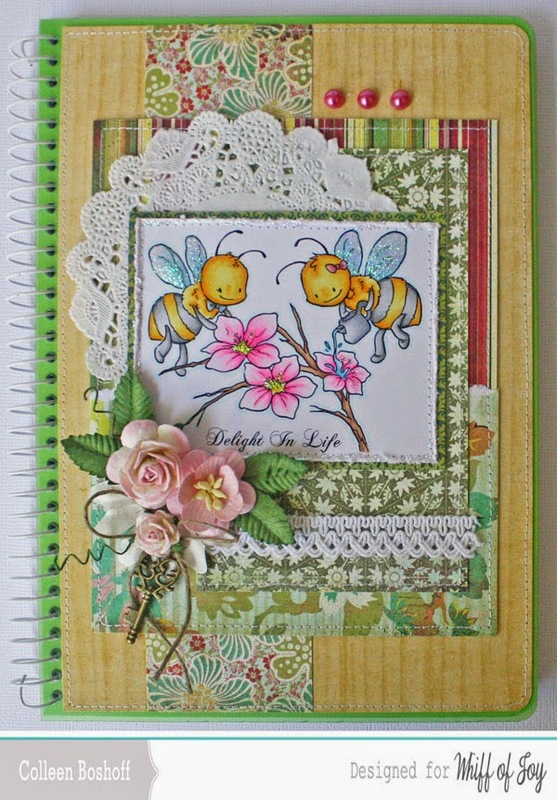 Your altered notebook is fab! Love the coloring and details. this Book is phantastic and so cute. The Bees love it! Thats a wonderfull image, very lovely and all that dacoration with the great flowers...a fantastic creation! I love your notebook! Hugs, Susanne. Wow, i love this , beautyfull colours you used. What a sweet card...love your color combo!